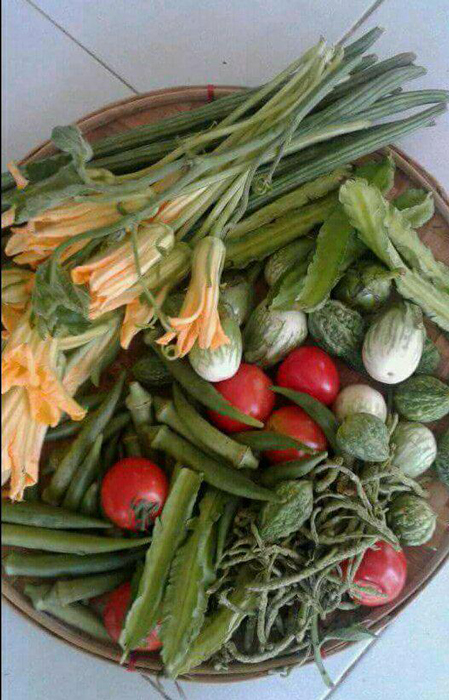 In Grade Three, on "Araw ng Tinda,""Araw ng Tinda," I learned to pick pinakbet staples, like wee ampalaya (bitter melon) and round talong (eggplant), and dive into the mound of itchy okra to pick out the small ones. My mentors, Celing, 11, the only girl in a brood of six, and Linda,12, would oftentimes scold me for picking the wrong ones. "Break the okra tips and see if the slimy sap dribbles out once the tip snaps," Celing would say, and I would obey, risking the ire of the sunburnt maglalakô (peddler) who had just dumped the produce from her bákol (basket) coiled rags still on her head. "Apunay met, daytoy nga ubing!" (My goodness, this child!) she would exasperatedly say. and I would hurriedly hand over five centavos but demand "dagdag," taking two more pieces. Next stop would be the mounds of "camoteng Tarlac, cream-colored on the outside but golden inside, that children our age would unload in tandem from jute sacks. Linda, who had to feed 12 panaderos (bakers) in my aunt's bakery on a tight budget, would get a dozen pieces and say she was done for the morning, and had to hurry home to help in the cooking. Pinakbet vegetables: (clockwise) bulaklak ng kalabasa (top left), sitaw (top) sigarilyas (winged bean, top right) round eggplant, small ampalaya (bitter melon), red tomatoes, himbaba-o (lower right), okra. But my mother's list was different: get sigarilyas; sitaw; bataw; patani; bulaklak ng kalabasa (pumpkin blossoms), and, of course, those plump red-green tomatoes with the many bulging sections. 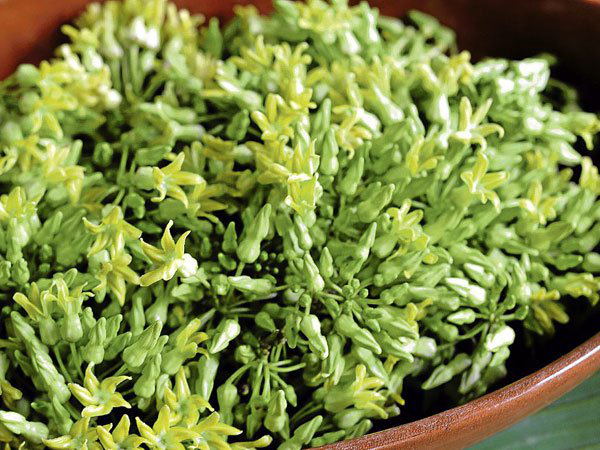 “If you're lucky, get some pusa-pusà, she would say, those bunches of tiny green buds and flowers shaped like "pusa" (cat) as a first-grader would draw it, that grew wild in the rainy months. On the way home, Celing would single out and bite on overgrown sigarilyas from my basket, lecturing me that I had been "cheated." I took it all in stride for I still had much to learn from her: how to snap the tips and get the fiber off them; how to consider the sepals of talóng (eggplant) because you don't remove those; how to get the pistils of the bulaklak ng kalabasa without hurting the petals; how to mash the “bungang sitaw” in rock salt, rinse twice. I was all ears. But suddenly, she said we had to go back to the market because we forgot the himbaba-ó. "But my mother didn't order that," I protested. 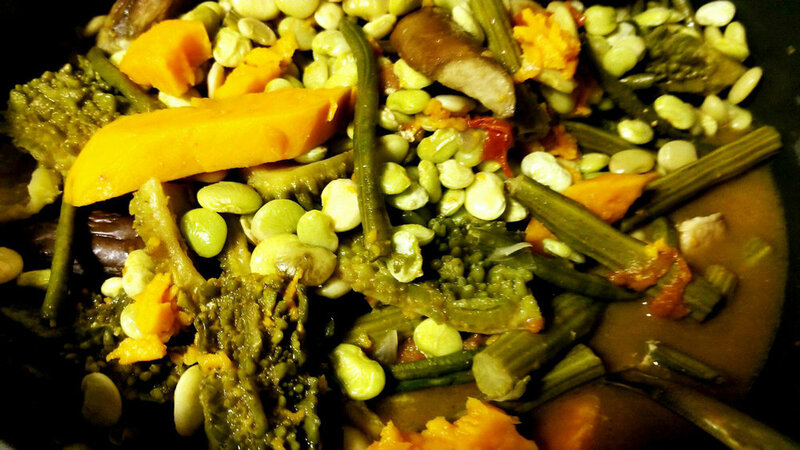 "Pinakbet is just not pinakbet without the alukon or himbaba-ó on top of it!" her big, matter-of-fact eyes telling me I was stupid. We looked for it in every stall. Nada. And then we tried the bigger puestos (stalls), the "mainstays," and one had a few tumpoks (piles) left. There they were: two-inch long green, soft buds that looked like tiny bottle cleaners. Back to the kalán (clay stove) with Celing. Boy, did she work fast, talking as she hit two live gourami on the head with a tabák (bolo). She then tossed them on the ashes to scrub away the slime. After rinsing and salting, she set them on a parilya (wire grill). Then in the red clay palayok (pot), she poured just a teaspoon of oil, which shortly sizzled with sliced tomatoes and alubaybay (some call it monamon). The patani and camote went first with a cup of hugas-bigas (rice washing). After ten minutes and an approving bite on the patani, she tossed in the sitaw, bataw, sigarilyas, talong, and covered the pot. After boiling for a few more minutes, she opened it. Holding the pot at the mouth with two rags, she gave it two or three shakes, then tossed in the ampalaya. "After you put ampalaya, you just let it stay on top, don't toss with a sandók (ladle), don't shake until you're ready to put the "sagpao" (gourami). Fragrant sabaw (broth) bubbled out of the lid, and it was time for the grilled gourami. The last but definitely, not the least, to go in are bulaklak ng kalabasa and himbaba-o. "Is it done?" I asked my Master Chef. "Almost," she said expertly. "Don't open the lid. It needs one last shake." Ahh, the scent of alubaybay melded with mashed tomatoes and the sweetness of camote. The taste of himbaba-ó on the roof of my mouth! Which is why, when friends suggest pinakbet from some fancy restaurant's menu, I just smile and say, "Pass." Rochit I. Tañedo is a freelance journalist and documentary filmmaker. In 2012, she accompanied forty parents of migrants to Korea. Since then, the Pinay wives, with the help of women’s NGOs and church institutions have advocated more fiercely for their rights through social media.